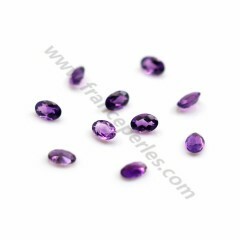 Amethyst cabochon, in size of 4*6mm, in faceted oval shape, sold by unit, crimp on a ring holder, or pendant. 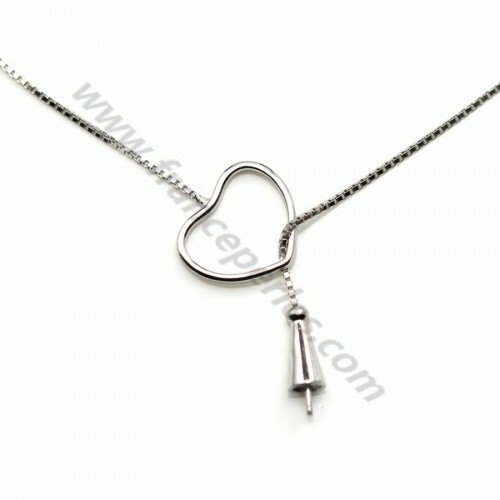 Chain in 925 sterling silver rhodium, square mesh 0.8mm, for semi-pierced pearl. The length of the chain is 45cm. Gold sterling silver ear clutches, in size of 6mm, sold by 6 pieces. 14k gold filled 16*24mm ear wire, sold by 2 pieces. Gold-filled technique consists of a base metal such as brass or copper, to which a sheet of gold is bonded by pressure or other means. To qualify as gold filled, an article of jewelry must have a layer of gold at least 1/20th, or 5% of the weight of the entire article. Charm to engrave, in round shape, plated by "flash" gold on brass 10mm, sold by 6 pieces, color gold or silver. Blue cyanite, in flat drop shape, 8.5 * 10mm, sold on a wire of 40cm, cyanite is recommended for shy people, introverted and complexed because it will soothe their anxieties. Choose your tahitian cultured pearl in different lot of weight! There may be up to 60% of the surface with defects concentrated. Once assembled, the visible face of the bead will be perfect. The chandelier is good or excellent. If a piercing of these beads is requested no return will be possible for these pieces. Needle made from a twisted wire, which loops at the end, enabling the insertion of a string. Thinner and more flexible than other needles, this one is ideal to use when threading strings through beads with a narrow hole such as fresh water pearls and seashells, corals and other gems. Skull with the eye zirconium oxide perforated, consisted for the earring and Necklace and bracelet. 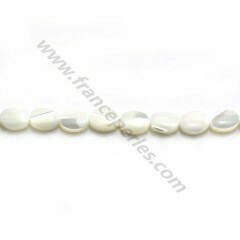 White mother-of-pearl, in the shape of a oval, 6*8mm, sold by a bag of 10 pieces. White mother-of-pearl, in the shape of a washer, 2*6mm, sold by a bag of 20 pieces. White mother-of-pearl, in the shape of a washer, 2*4mm, sold by a bag of 30 pieces. Multicolored tourmaline, in round and flat faceted shape, 4mm, sold by 12 pieces, tourmaline has the property of being one of the most powerful stones in the absorption of negative energies and to dissolve them at the level of the ground. 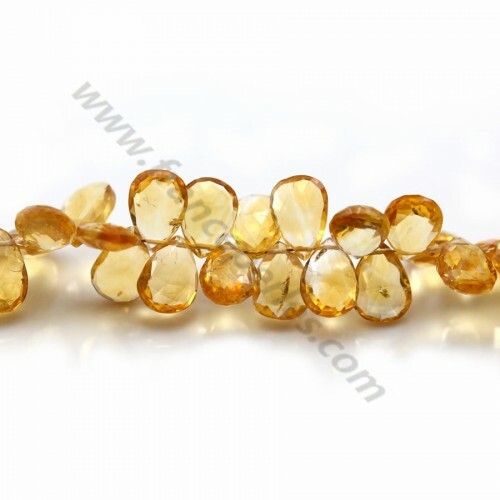 Citrine drop faceted, different size avalaible , for all your desires to create original jewels. 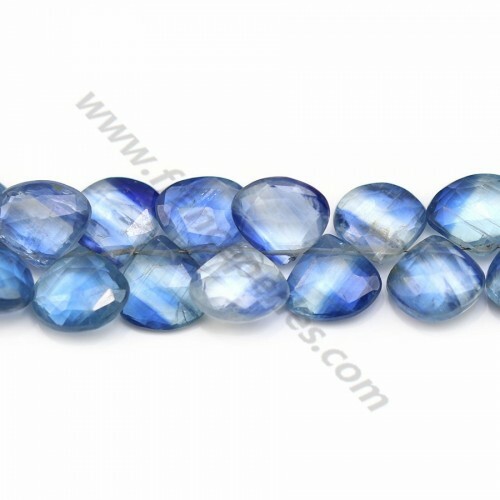 Moon Stones in round faceted flat shape, 4mm, sold by a bag of 10 pieces, the Moonstone would bring happiness and reduce the risk of accident. It would be for that the asset of the travelers. 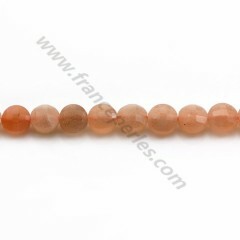 Orange sun stone, in round faceted flat shape, 6.5mm, sold by 5 pieces, the sunstone gives us self-confidence, frees us from our complexes, our fears and our inhibitions, it brings us courage not to postpone everything to the next day. 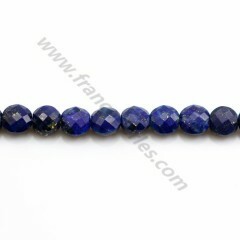 Lapis lazuli in round flat faceted shape 4mm, sold by 8 pieces, this beautiful stone of a light blue to deep sprinkled with golden glitter attracts the interest of men since always. 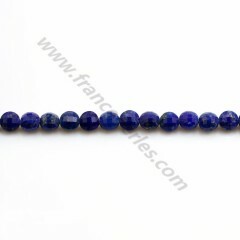 Lapis lazuli in round flat faceted shape 6mm, sold by a bag of 5 pieces, this beautiful stone of a light blue to deep sprinkled with golden glitter attracts the interest of men since always. A shop with a thousand colors, located in Paris 9 rue Reaumur, under the name of "Amelie". We select carefully the best pieces for each your order, and all photographs taken are not retouched in order to show you the real state of our products. Each stone has its history, inclusions, and its colors which answer your different sens of taste.